This pool and spa is built in an affluent neighborhood with many new homes that are traditional in design but have modern, clean details. Similar to the homes, this pool takes a traditional pool and gives it a clean, modern twist. The site proved to be perfect for a long lap pool that the client desired with plenty of room for a separate spa. The two bodies of water, though separate, are visually linked together by a custom limestone raised water feature wall with 10 custom Bobe water scuppers. Quality workmanship as required throughout the entire build to ensure the automatic pool cover would remain square the entire 50 foot length of the pool. 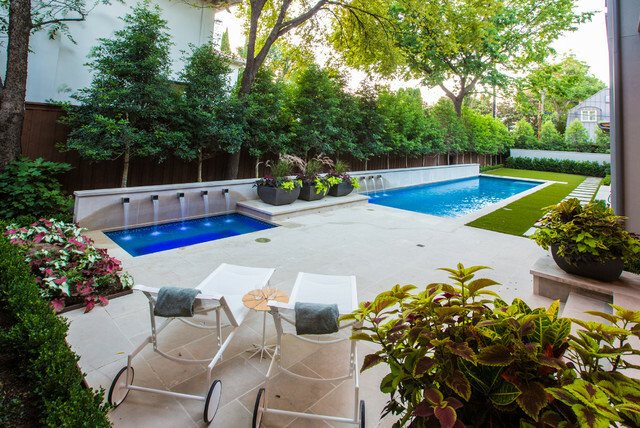 This outdoor environment cohesively brings the clean & modern finishes of the home seamlessly to the outdoors to a pool and spa for play, exercise and relaxation.